The United States Armed Forces has long valued the contributions of immigrants—from the War of 1812 to the ongoing conflicts in the Middle East, U.S.-born and immigrant soldiers have fought alongside one another with no concern for nationality or immigration status. Yet, within the first several months of the Trump presidency, the administration has created additional and unnecessary barriers for immigrants looking to serve. A detailed history of immigrants’ service in the military is outlined in a new report from The National Immigration Forum, For the Love of Country: New Americans Serving in Our Armed Forces. The report details the military’s need for a broader pool of eligible applicants and how immigrants could—if allowed—fulfill that need with critical foreign-language, medical, and cultural skills. Approximately 40,000 immigrants serve in the U.S. military, with 5,000 noncitizen soldiers typically enlisting each year. As of 2016, approximately 511,000 immigrants were veterans. Moreover, 11 percent of all U.S. veterans come from an immigrant background; they are either foreign-born themselves or have an immigrant parent. In addition, 20 percent of all Medal of Honor recipients—the highest distinction given in the military—are immigrants. The sheer volume of immigrants willing to serve is critical as the pool of eligible applicants nation-wide continues to shrink. Accounting for all of the factors that render young adults unavailable or unqualified for the military, only 13 percent of 17- to 24-year-olds are eligible to serve. The Army, for instance, estimates that out of a total target recruitment population of 33.4 million, only 136,000 young people (0.4 percent) would be qualified to serve. For its own recruitment efforts, the Army estimates that it will need to spend an extra $300 million in advertisements to recruit 6,000 additional soldiers to fulfill its target of 68,500 recruits by the end of the fiscal year. By actively recruiting immigrants, the military could significantly reduce this gap. According to the report, immigration is predicted to be the only future source of net growth in the U.S. population among 18- to 29-year-olds, the target age range for military recruits. Currently, the number of noncitizens who are both recruitable and in this desired age range is approximately 1.2 million. Beyond the numbers, the talent immigrant recruits provide is unique. 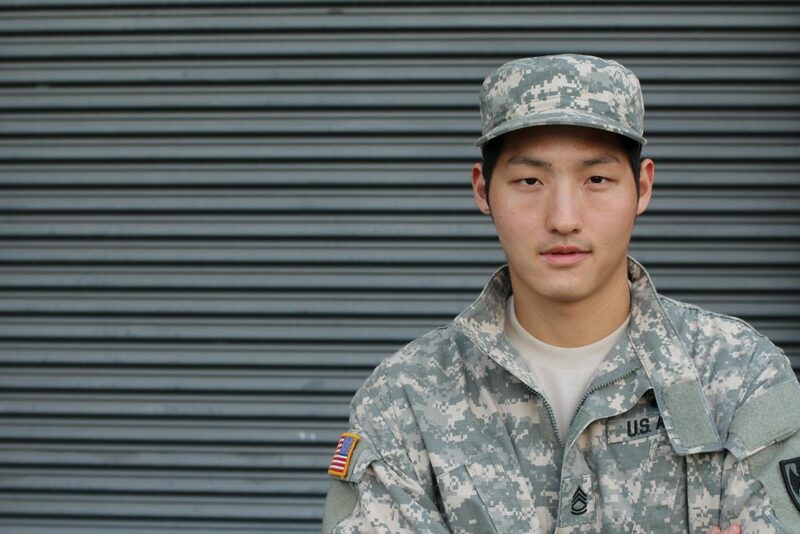 From 2009 to 2016, the military made a special effort to recruit noncitizens specifically for their ability to speak certain languages, cultural competency, and medical skills. Noncitizen recruits are also far more likely to stay for the entire length of their service, saving the military valuable money and time. Yet the Trump administration’s new, additional barriers for immigrants wishing to serve have largely blocked the Armed Forces from accessing this group of young people. In October 2017, the administration reversed a long-standing policy that allowed immigrants serving in the military to fast-track their pathway to citizenship. Now, in addition to completing an extensive set of background checks, immigrant soldiers must navigate new bureaucratic obstacles to obtain citizenship. The Pentagon is also reportedly considering a halt to The Military Accessions Vital to the National Interest (MAVNI) recruitment program, which was open to noncitizens (and even some undocumented immigrants) who possessed critical language or medical skills. If the program is halted, 1,800 troops recruited through the MAVNI program could lose their enlistment contracts. It is estimated that roughly 1,000 of those immigrant recruits could be out of status, opening them up to the risk of deportation. In addition, the Pentagon has also implemented a new policy that indefinitely halts all enlistments involving green-card-holders looking to join the Army Reserve and National Guard. There is also an unacceptable future potentially awaiting some immigrant veterans upon returning to the United States: the risk of deportation. Should immigrant veterans—some of whom battle unemployment, physical, and psychological stress after returning from deployment—ever commit a crime that is considered an “aggravated felony” under immigration law, they could face deportation and permanent banishment from the country that they served. The immigrants serving in the United States Armed Forces must be treated with respect, just as any U.S.-born soldier would expect. This means actively recruiting immigrants who wish to serve, as well as giving them all of the benefits for which they are entitled upon returning home. To do anything less is un-American.